Freaks and Geeks: Paul Feig’s character bible for the show. Paul Feig’s 1999 blueprint for the show. The freaks and the geeks. Excerpted from Poking a Dead Frog: Conversations With Today’s Top Comedy Writers by Mike Sacks, out June 24 from Penguin Books. This show must be real. The teens in this series will talk like real teens. They will never be too clever or grown-up sounding. We don’t want a bunch of teenage Neil Simons spouting off wittily. These kids generally engage in teenage put-downs, they overextend their language (“Oh, yeah? Well, you’re a … uh … big idiot, that’s what you are”) and never talk in that writers’ “Now that I’m in my 30s, I know what I’d say in that high school situation, so I’ll give this kid a snappy comeback” style of writing. These kids have to deal with each other with whatever is in the lexicon of a teenager and nothing more (and despite the fact that most of us think “if I knew then what I know now, I’d really be cool and in control,” the sad truth is that if we knew what we know now when we were in high school, we’d probably get beaten up on a regular basis because teenage bullies don’t respond well to clever put-downs at their expense). 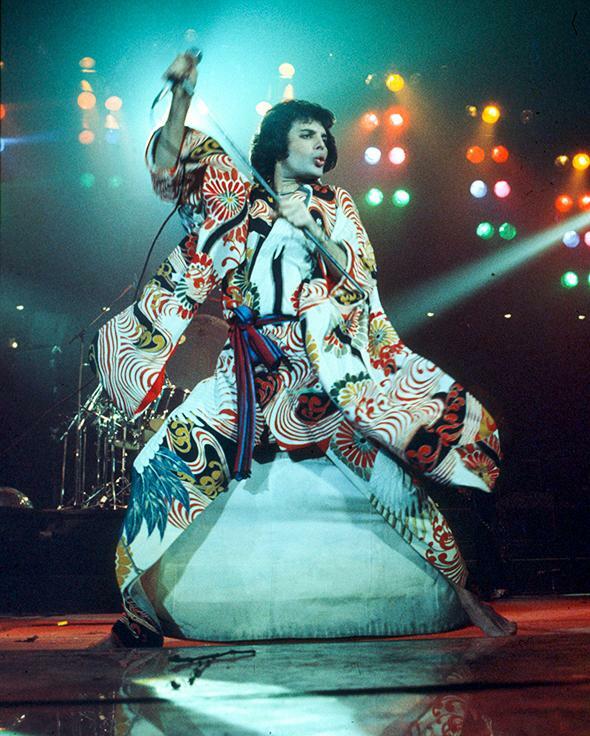 Freddie Mercury, circa 1977. 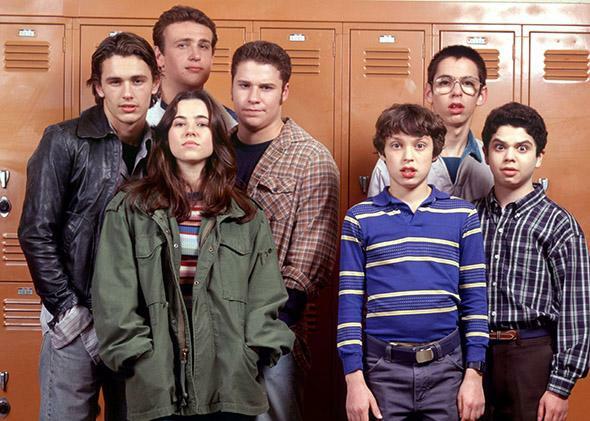 Both the freaks and geeks could appreciate Queen. Overall note is that all the students will have about four or five outfits they will wear all the time. Pants can stay the same a lot of the time, shirts change daily (except for some poorer kids). Even cool kids and rich kids shouldn’t have a lot of different changes. Bottom line, all these kids are blue collar or lower-end white collar. In general, the geeks try to dress well but just don’t quite pull it off. Maybe if they were better looking or cooler guys, their clothes would make them attractive. But on them, no matter what they wear, it somehow doesn’t work. Overall look: Sam looks like a kid who cares about how he looks but only up to a point. He dresses more for comfort and his fashion sense is limited to knowing what other kids are wearing and then trying to approximate their look. He thinks he looks better than he does in his clothes. (Everything looks fine to him from head-on in the mirror, but he doesn’t see that what he can’t see doesn’t really hang well.) He’s not so much rumpled as the victim of poorly made clothes. Shirts: Pullover velour V-neck shirts with collar (a little baggy and ill-fitting), short-sleeved knit pullover with zipper V-neck and collar (white stripe on edge of collar and sleeves), terrycloth pullover with two- or three-button V-neck and collar (shoulder pieces are darker color than rest of shirt, with a stripe on each upper arm), not usually tucked in. Pants: Brown, green, burgundy jeans, never denim blue jeans (until second season), occasionally polyester slacks. Shoes: Tan suede earth shoe hybrids with rimpled soles (remember those things? The soles were shaped like two W’s and the whole shoe looked kinda pumped up like a loaf of bread—see Paul Feig for details), dark suede tennis shoes (occasionally). Coat: Parka, faux–Members Only jacket (maybe), windbreaker with stripe or father’s sporting goods store logo embossed on back (cheap, low-end looking). Accessories: Always a belt, sometimes with a large copper novelty belt buckle (like a train or Model T car or a tennis racket). 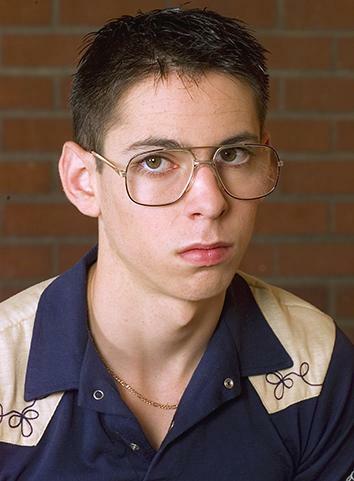 Martin Starr as Bill Haverchuck. Overall look: Bill’s pretty much a mess. But not a sloppy guy. His family isn’t very well off, but his mother tries to dress him nice. The result is a lot of clothes from the irregulars bin. He looks like a guy who leaves the house neat but immediately becomes unkempt. Bill is so unaware of his clothes that you get the feeling he doesn’t care what he wears. Shirts: Plaid cowboy shirts, sweater vests (Bill tries to take his fashion cues off of Neal, but it’s always off a bit), brightly printed button-up shirts, pullover shirts that no one else would buy (different color swatches sewn together, weird patterns patchworked into solid colors, stuff from the irregular bin). Pants: Off-brand jeans, rumpled khakis, occasionally vertically striped pants. Shoes: Orthopedic black dress shoes (not jokey looking—just sensible-looking shoes), suede gym shoes (Tom Wolf brand—see Paul Feig for explanation). Coat: A beat-up, hand-me-down football/baseball jacket with the name of the school on it. Linda Cardellini as Lindsay Weir. Overall look: Lindsay is trying very hard to look like a freak. She pulls it off very effectively, but there’s always something a little studied about her look. She dresses down, but her clothes are always pretty clean. She tries to be sloppy but can’t help primping and neatening herself. A lot of her clothes come from her father’s sporting goods store, so they’re rather new looking. You’d have to look close to see that she’s not truly a freak, but it shows. Shirts: T-shirts (flower-embroidered, band logo iron-ons), thermal underwear shirts, solid color sweaters (occasionally cowl neck), button-up plaid shirts (tucked in). Pants: Bell-bottom jeans, old painter’s pants, overalls. Shoes: Black suede rubber-soled shoes, clogs, old running shoes. Coat: Old plaid hunting jacket, army field jacket, old worn parka, long wool coat. Accessories: Worn knapsack for books. Overall look: Daniel has the original grunge look, before it had a corporate name. Shirts: Plaid flannel shirts with T-shirts underneath (usually black T-shirts). Shoes: Work boots, old sneakers, snowmobile boots in the winter. Coat: An old army field jacket, an old sweatshirt under his coat if it’s very cold out. Accessories: Scarf, snowmobile gloves, never wears a hat (it would mess up his afro), a large afro pick is always in his back pocket (although we never see him use it).